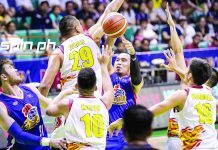 MANILA – TNT KaTropa bolstered its bid for a top-two finish in the 2019 Honda PBA Philippine Cup after a 101-98 escape over the Columbian Dyip last night at the Ynares Center in Antipolo City. Jayson Castro finished with 20 points while Ryan Reyes and Jeth Troy Rosario had 19 points each. The KaTropa cruised to its fifth straight win to improve to a 7-3 win-loss slate. 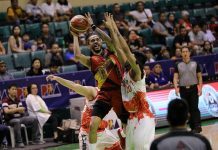 The KaTropa have also moved closer to sealing a twice-to-beat quarterfinals incentive if it wins its remaining match against NorthPort Batang Pier tomorrow and hope that Barangay Ginebra San Miguel Kings (5-3) drop one of its remaining matches. “We know how important our last two games are. Ganun pa rin, our plan is to win the every game, every time. Our last game is NorthPort. 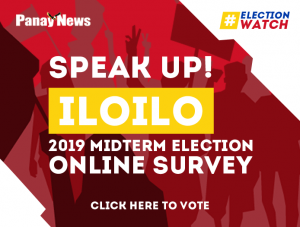 Kailangan ready kami. Hindi kami puwedeng mag-relax,” said KaTropa head coach Ferdinand “Bong” Ravena. KaTropa’s victory against the Dyip did not come easy. It saw its 18 points edge trimmed to 91-94 by a strong fourth quarter run by the Dyip before creating distance anew at 101-93 on hits from Kelly Williams and Yousef Taha. Columbian made its last push to come to within 98-101 on two free throws by John Paul Calvo and a triple by Rashawn McCarthy but KaTropa hang on to defense in the final seconds forcing McCarthy to miss on two potential game-tying treys. 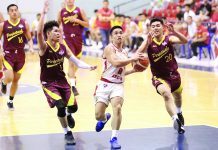 Jaymar Perez had 22 points, nine rebounds and five assists while McCarthy added 17 markers for the Dyip, which ended their elimination round matches with 4-7 win-loss card. Meanwhile, Magnolia Hotshots bolstered its quarterfinals hopes after taking down Blackwater Elite, 97-87, for its second consecutive victory. The Hotshots now has 5-5 win-loss card while the Elite bows out with 2-9 slate.